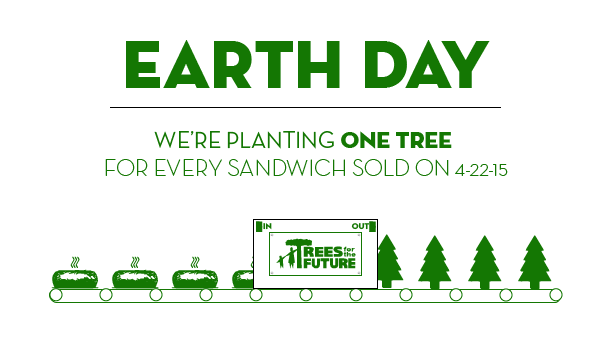 For the second year in a row, Planet Sub is planting one tree for every sandwich they sell on Earth Day, Wednesday, April 22nd, 2015. The company has once again partnered with non-profit Trees for the Future, committing to planting trees in the developing world. Last year, the oven­-baked sandwich franchise was able to plant 8,149 ​trees, but this year with several new stores open, and some new ideas, they’ve increased their goal to 15,000​ trees. “Last year we saw our customers come out and really embrace the campaign,” said Trevor Forssell, Marketing Director for the 34 unit sandwich chain, “we’re extending the crowdfunding to include catering this year, which we hope will generate some early numbers for the campaign. We are going to work with our best catering customers and invite them to be a partner alongside us this Earth Day!” Planet Sub has committed to plant one tree for every $5 in catering placed for Earth Day, 2015. With the singular goal of “Planting Trees, Changing Lives”, Trees for the Future helps to revitalize degraded lands by providing farmers with tree seed, technical training, and on­site planning assistance in hopes of helping people save their homes and way of life. Trees for the Future currently has operations in 19 different countries throughout Africa, Asia, and Latin America and have plans to plant their one hundred millionth tree some time this June. Planet Sub has 34 units, with over 80 franchise stores in current development.